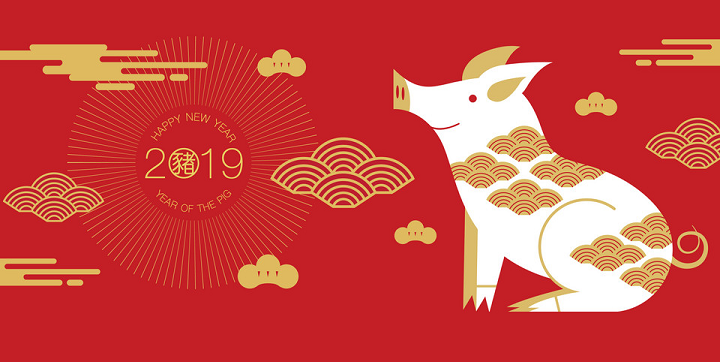 Дата: 17-20 января 2019 г.
В связи с празднованием китайского Нового года, имейте в виду, что офис HCI будет закрыт с пятницы, 1 по воскресенье, 10 февраля. Все дела возобновятся в понедельник, 11 февраля. Мы благодарны за ваше понимание. Счастливого китайского Нового года свиньи! Дата: 12-15 марта 2019 г.
Дата: 16-23 октября 2019 г.
Taipei Plas 2016 has come to a close on Aug. 16th. It has been a success for HCI. What was more exciting was that we won the First Prize of 2016 Taiwan Plastic & Rubber Industry Awards for Excellence in Research an Innovation. This can be the motive power and drives us to do radical product innovation. Finally, we would like to thank all our agents, customers and associates for their visit and participation. Meanwhile, we hope to see more customers in HCI excellent product lines. 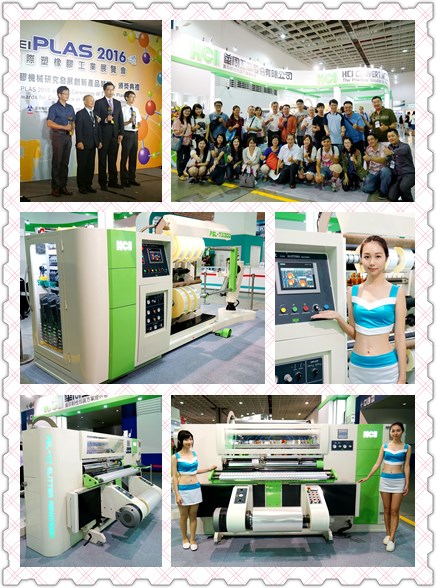 Taipeiplas 2014, held once every two (2) years from September 26th to 30th with an estimated business success. There were 2,730 international visitors, an 8% increase, from 113 countries and total visitors accumulated to 18,643, a 17% increase from last edition. Taipeiplas 2014 closed with breaking record of scale and visitors. HCI have had positive feedback from visitors by exhibiting the latest 800 Rewind Slitter Rewinder (FSL-TX), compact type of hydraulic up/down unwind stand, finished roll pusher and turret type unloading tree. Among Taiwan's 1.3 million SMEs, the selected companies accounted for one tenth of the country's total exports in 2013 and will continue to drive the local economy. We would like to say "Thank You" for your visit at HCI booth at K 2013 and the kind conversation. 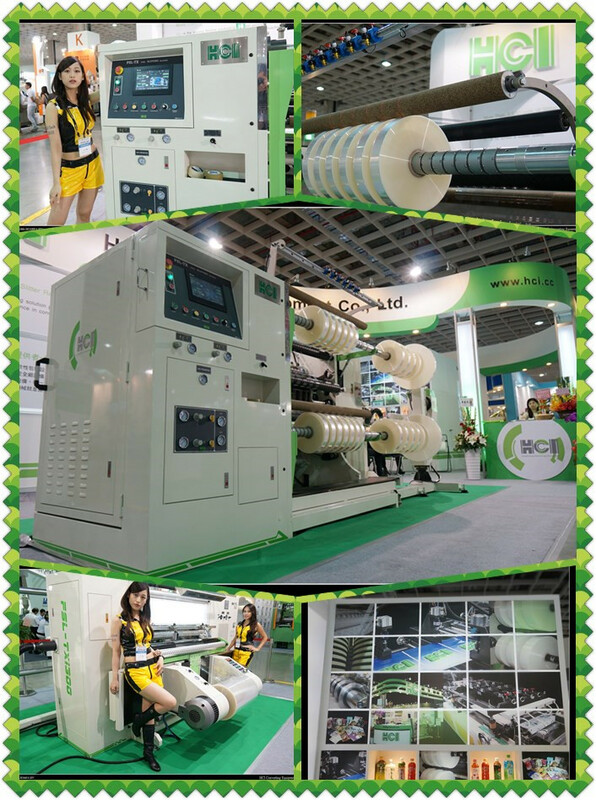 Your interest in our HCI machinery made us very happy and we hope we were successful in presenting the opportunities for the use of the machinery. [ Turret Type Unloading Stand ] New Optional Accessory for HCI Slitter, Reducing Unloading Time Greatly. Conventional unloading device for slitted-rolls has only horizontally swing-out upper and lower metal arms. Unloading of upper rolls is usually more difficult especially with larger OD rolls. We have now include turret function in our newly design unloading device. This new function rotates the upper and lower metal arms to the same horizontal level together, providing a safer unloading environment and reducing up to 60% of unloading time of slitted-rolls. All HCI center-rewinding type slitters now offer this new device as an optional accessory. If you require an upgrade to this device, please contact us for discussion. HCI has launched a new 3-side seal equipment module, customer can now make both centre sealing and 3-side seal pouches. 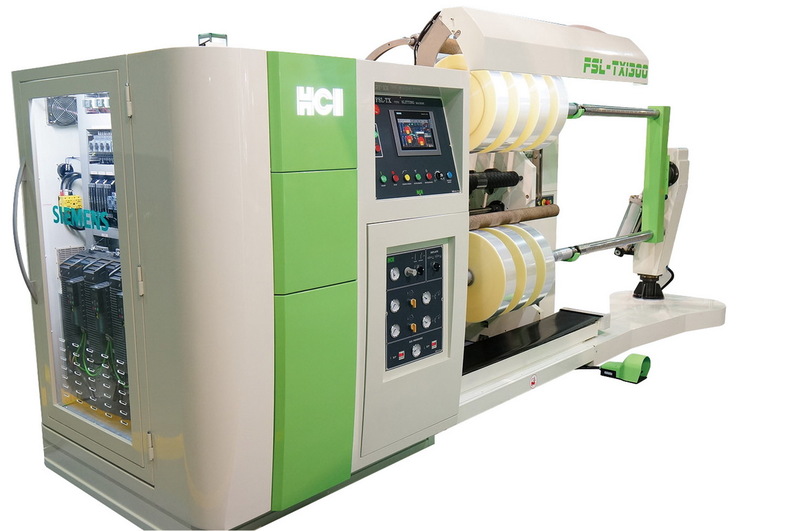 HCI has launched a new as an option for FK-FSC economical type centre sealing pouch making machine. With this option, customer can now make both centre sealing and 3-side seal pouches on their FK-FSC pouch making machine. The new 3-side seal equipment module adds a new dimension to the already simple and well tailored FK-FSC model. This new module consists of 3 rows of side seal unit, multiple razor blade mounting unit and a trim removal unit. It only occupy a small space despite the many functions it provided. The 3-side seal module can also be installed on FKSC-V series of servo driven centre sealing pouch making machine. Hence, adding more flexibility to the production line. 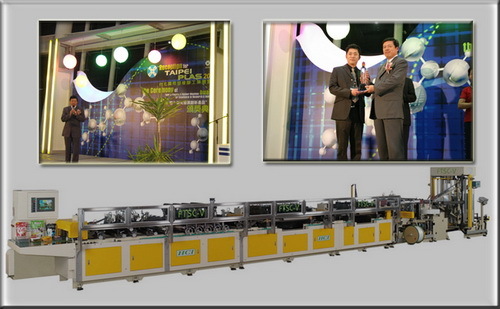 The newest model of HCI embossing machine has been well received on the market. Soon after it was just introduced, multiple orders have been placed from the Middle East, Asia and other countries. 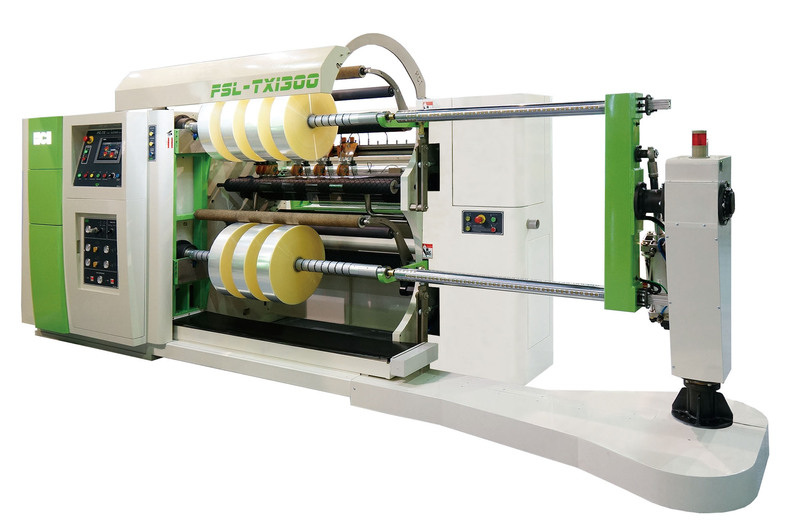 FEM Series embossing machines are suitably for surface embossing operation of paper rolls, foil and other composite materials.It is capable of producing finished products, such as aluminum foil of cigarette packaging, the embossed surface of various types of beverage labels, books covers, etc. It enables to make the product more aesthetic as well as enhance its value. Hydraulic unwind stand is optional for the new generation model. Its function of hydraulic horizontal movement has significantly improved the convenience of loading. Meanwhile, its brake system has also been upgraded to air type to provide excellent braking performance. The newly developed mechanism of embossing is Equipped with hydraulic control movements with precision of gear transmission, stronger and more durable than the previous generation models. 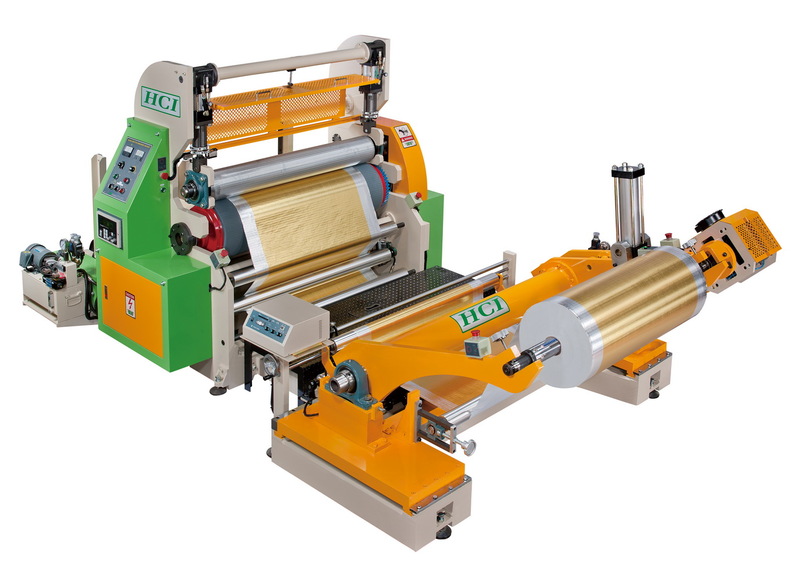 The operator can choose upper and lower embossing rollers with linking or no linking according to the operational needs. Consequently, it is easy to complete one side or both sides embossing operation. In the meantime, the embossing mechanism can have micro-adjustment for horizontal embossing depth, overcoming the uneven thickness of web or embossing roller diameter and other factors. It therefore ensures that the embossed product can be flat and smooth without wrinkles. In electronic control, we add the function of auto-lift for rollers. 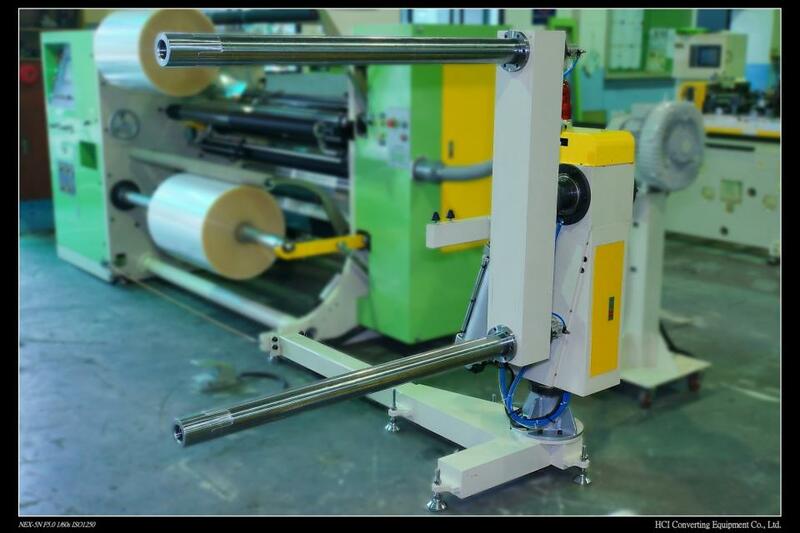 After the device is shut down, the upper and lower embossing rollers will be automatically separated, To avoid deformation from prolonged roller pressing, which may affects production quality. 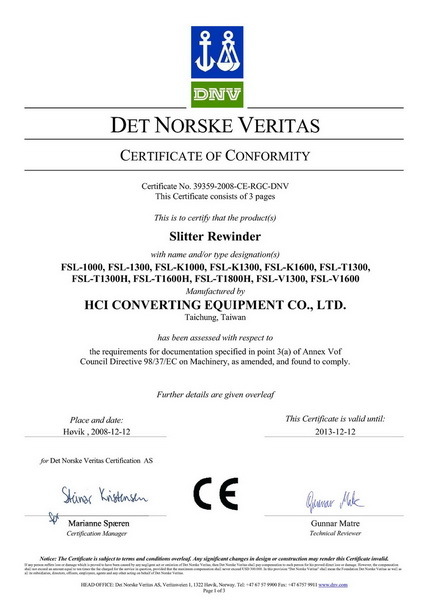 HCI Slitter-Rewinder had passed the audit for CE certification on Nov.2008 and the CE certificate was issued by international authentication organization DNV. 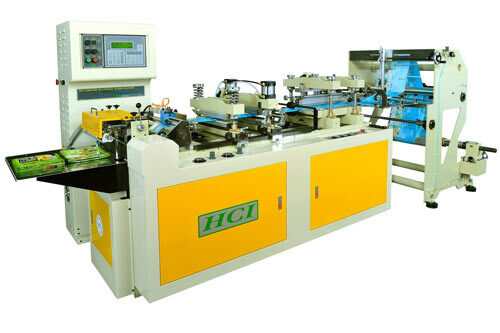 HCI has awarded the second prize for its FTSC-V series servo in line 3-side sealing/stand-up/zipper pouch making machine in the other plastic machine of the award for excellence. Design & innovation-plastic & rubber. Seven servo motors drive system : Main drive servo motor*1 : The operator can change the feeding and sealing time for each material independently. Sealing temperature adjustment unnecessary while machine speed up. This mechanism can help to reduce the lost of material greatly. The structure of brand-new outside transmission mechanism is much simple and easy to maintenance. One lane of bottom gusseted stand up pouches production if two functions unwind stand is purchased (Patent No.M254422). Both side printed film auto. adjusting device. The newly developed zipper sealer and side sealer auto descending device which can prevent the material been overheated or broken when machine stop. Man-Machine interface control system. The automation man-machine system collocates with high-quality mes mechanical and electrical integrated controller. LCD colorful touch screen; simple figure display for setting and easy operation. HCI zipper guiding and cooling plate (Patent No.178721).